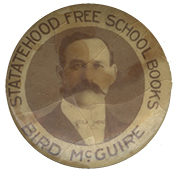 McGUIRE, Bird Segle, (cousin of William Neville), a Delegate and a Representative from Oklahoma; born in Belleville, St. Clair County, Ill., October 13, 1865; moved to Randolph County, Mo., in 1867 with his parents; attended the common schools; moved to Chautauqua County, Kans., in the spring of 1881, and then to Indian Territory; engaged in the cattle business; attended the State normal school at Emporia, Kans. ; taught school several terms; later attended the law department of the University of Kansas at Lawrence; was admitted to the bar in 1889 and commenced practice in Chautauqua, Kans. ; prosecuting attorney of Chautauqua County, Kans., 1890-1894; moved to Pawnee County, Okla., in 1894 and practiced law in Pawnee; appointed assistant United States attorney for Oklahoma Territory in 1897, in which capacity he served until after his nomination for Congress; elected as a Republican a Delegate to the Fifty-eighth and Fifty-ninth Congresses and served from March 4, 1903, to March 3, 1907; elected as a Representative to the Sixtieth and to the three succeeding Congresses and served from November 16, 1907, when Oklahoma was admitted as a State into the Union, until March 3, 1915; chairman, Committee on Expenditures in the Department of the Interior (Sixty-first Congress); was not a candidate for renomination in 1914 to the Sixty-fourth Congress; resumed the practice of his profession in Tulsa, Okla.; also owned and operated a large ranch near Bartlesville, Okla.; died in Tulsa, Okla., November 9, 1930; interment in Memorial Park Cemetery.